El clima de Dayton té els estius càlids i plujosos i els hiverns freds i secs. En la Classificació de Köppen és Cfao bé Dfa, segons la isoterma que s'esculli. Al seu aeroport la temperatura mitjana del gener és de -2.5 °C i la de juliol és de 23,4 °C. Hi pot haver tornados. La pluviometria mitjana anual és de 1.040 mm. ↑ «Population Estimates». United States Census Bureau. [Consulta: 2 desembre 2014]. ↑ «Population and Housing Occupancy Status: 2010 – United States – Metropolitan Statistical Area». 2010 United States Census. United States Census Bureau, Population Division, 14-04-2011. [Consulta: 13 desembre 2011]. ↑ «Population and Housing Occupancy Status: 2010 – United States – Combined Statistical Area; and for Puerto Rico». United States Census Bureau, 2010. [Consulta: 23 abril 2011]. ↑ «Dayton Inventions». City of Dayton. [Consulta: 3 setembre 2011]. ↑ «Dayton Aviation History». Ohio History Central. [Consulta: 4 juliol 2009]. ↑ Robert W. Steele and Mary Davies Steele. Early Dayton. W.J. Shuey, 1896, p. 23. ↑ Board of Education. 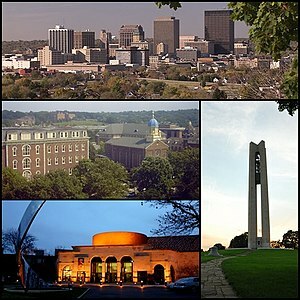 An Outline of the History of Dayton, Ohio 1796–1896. W.J. Shuey, 1896. ↑ «Weather.com historical temperature data for Dayton». The Weather Channel. [Consulta: 4 octubre 2007]. ↑ «Annual Estimates of the Resident Population for Incorporated Places: April 1, 2010 to July 1, 2014». [Consulta: 4 juny 2015]. ↑ «Annual Estimates of the Resident Population: April 1, 2010 to July 1, 2014». United States Census Bureau. [Consulta: 24 juny 2015].